Just under a month ago, I was approached by Kitchenware Direct to see if I'd like to test out one of their slow cookers or pressure cookers. Y'all know how obsessed I am with cookware, so of course my answer was yes! After looking through all the slow cookers and pressure cookers on the website, I ended up choosing the New Wave 5-in-1 6L Multicooker, which has both slow and pressure cooking functions! When I was a kid, my mum often used an old-school stove top pressure cooker - it rattled, it shook, and it spewed forth loud bursts of steam. In short, I was terrified of it. Many years later she upgraded to an electric pressure cooker, but we only used it a few times before it got relegated to the cupboard. I guess at that point we just didn't cook enough stews to make it worthwhile. 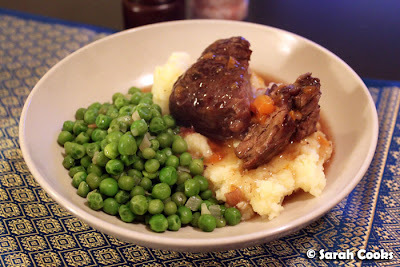 Tonight I made shiraz-braised beef, which only took 30 minutes on the pressure cooking function, plus about 10 minutes either side to brown the meat and veggies, and to thicken the sauce at the end. Pretty good going for a dish that usually takes 3-4 hours! The browning function heats up very quickly and evenly, and it's easy to get a nice crust on meat. You can't adjust it though, so sometimes it can be too strong if you're, say, sautéing onions as the first step of a stew. I'll often turn the heat off if it's getting too hot, and turn it back on again to keep the temperature under control. While the stew was having its 30 minutes pressure-cooking, I whipped up some petits pois à la Francaise and some potato/celeriac mash. Wonderfully comforting for such a cold and blustery day! The soup function is pretty much the same as the low-pressure function, and I've found it useful for making soups (duh) and stocks in a short amount of time. 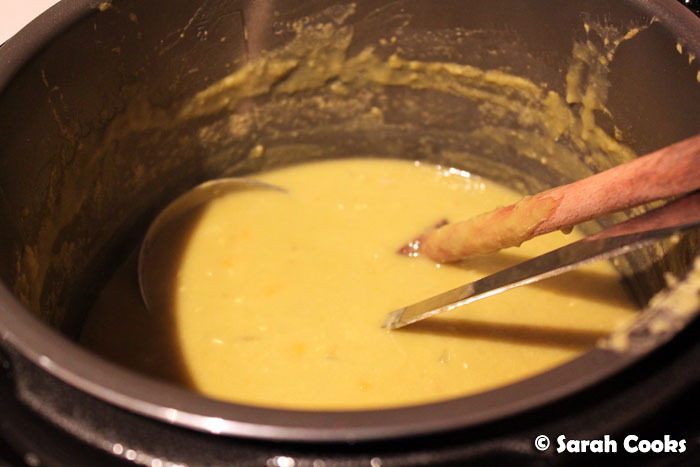 For example, let's take a look at this split-pea and ham soup I made! ... to this! A hearty, smooth soup. Perhaps the most exciting discovery we made was that you can make risotto in 7 minutes in the cooker! There was a recipe for mushroom risotto in the instruction booklet, and I must admit I was curious, and more than a little skeptical about a pressure-cooked risotto. You start as per a standard risotto: cooking onions in a little oil, adding the rice and some wine. 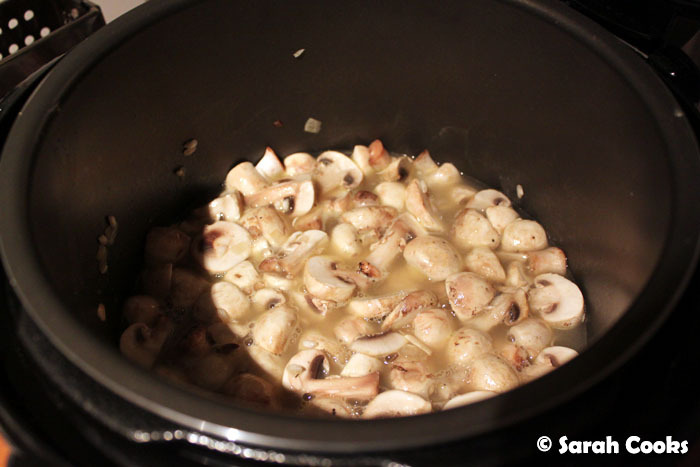 But rather than ladling in stock bit-by-bit, you tip it all in, with the mushrooms. 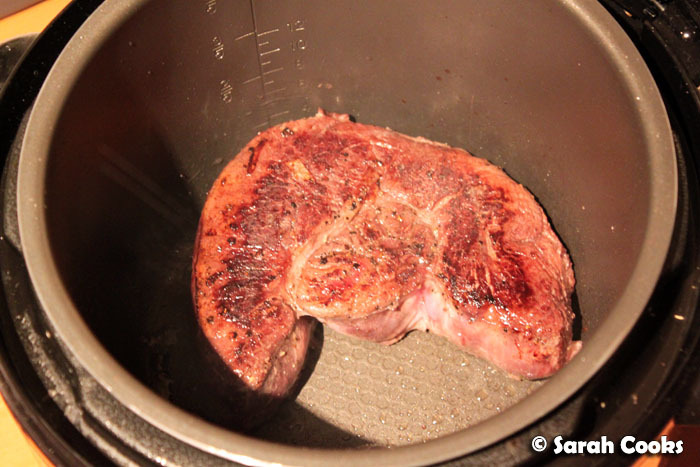 Chuck it on the high-pressure function and cook for 7 minutes. And then - ta-dah! - al dente grains of rice! Not gluggy, not mushy, no crusty baked on bits on the bottom of the pan! And best of all: no stirring. Love it! We've been eating a lot of risotto since the cooker arrived. 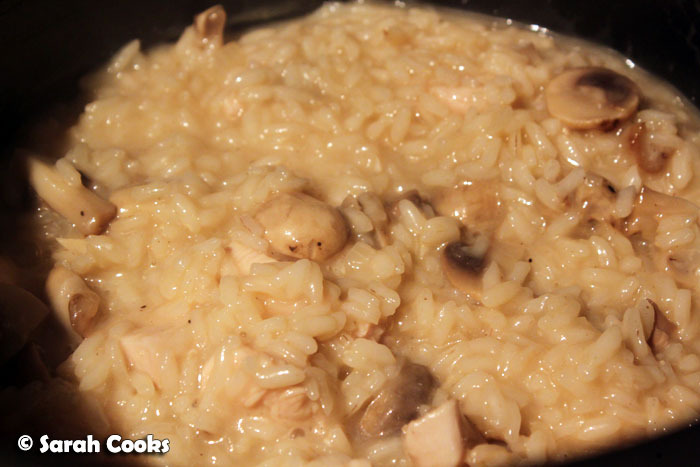 I've done mushroom risotto twice already this month, and have also made cauliflower risotto using the same method. I've been really happy with the cooker, and significantly, it's already become a regular part of my standard kitchen kit. In my enthusiasm, I also picked up a cheap, old-fashioned "Pressure Cooker Recipes" cookbook, and am really looking forward to making more warming dishes for this wintry weather! 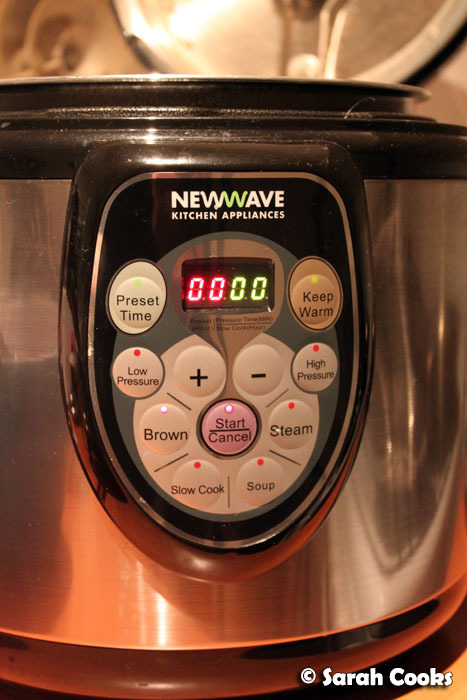 Sarah received the New Wave 5-in-1 6L Multicooker courtesy of Kitchenware Direct. I love love love this thing. The 7min Risotto is amazing!! Wow - that all looks delicious! 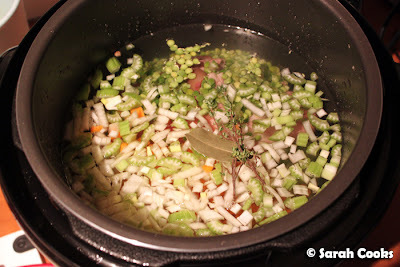 I recently got a slow cooker that I am slightly in love with, although I wish I had have gone with the slow cooker/pressure cooker combination now! my gosh, I need me a pressure cooker real bad. I keep using my mum's stove top one and yes, I'm also afraid, very afraid! This looks ace and I love the braised beef! Can I use this machine to bake bread? Sarah, have you cooked brown rice in this machine? Did u use their steam function. Does the rice brown on the bottom? Does it vent like the pressure function the whole of the cook time? (the exhaust function is engaged in the instructions.) Others say to pressure cook it 2:3 water for 15 mins - have u tried that? Really sorry but I haven't tried cooking brown rice in the machine - I've only ever cooked brown rice on the stovetop. But 15 minutes is pretty quick, I might try it in the pressure cooker next time! Had one of the 5-in-1 New Wave cookers and loved it! Stupidly, while in a rush, I tipped chicken, stock etc into my lovely machine not realising that I hadn't put the inner pot in. Everything went down into the innards of my cooker and as I couldn't take the risk of trying to wash it out and possibly electrocute myself, I threw it out - sob! Sob! Couldn't manage without it so ordered another one which, to my delight, arrived this afternoon! Lots of dishes being prepared for freezer this weekend. Heartily recommend this great appliance!!! Oh nooooo! What a disaster! I'd have been devastated!